The business was established in 1948 by Thomas Clifford Barlow and started with a small electrical shop repairing kettles and irons in the village of Malpas, Cheshire. In 1961 Barlows moved to larger premises with a bigger workshop, they now had two vans and a 24 hour call out system! 1965 saw Barlows opening a new shop in a High Street location in Malpas to enable the company to expand as the electrical contracting developed. By 1980 it was clear that a new premises was required due to the success of the High Street shop and the electrical contracting. A new shop was opened and the previous outlet remained open as a workshop to cope with the demand for repairs. Barlows Electrical becomes an NICEIC approved contractor in March 1982. The NICEIC is a leading voluntary regulatory body for the electrical contracting industry and all approved contractors work is completed to the highest of standards. In the 1980’s the company had ten vans on the road to deal with the increase in domestic and commercial clients. Barlows Whitchurch is also opened in the early 1980’s, a high street shop and office in the nearby market town. By the 90’s Barlows contracting had its own electrical testing department and a Nacoss security alarm division. Another retail outlet is opened in Ellesmere in Shropshire. Barlows Electrical becomes a limited company in 1993 and is now Barlows (UK) Ltd. The company now offers its clients the complete property maintenance package. Due to continued expansion in January 1998 Barlows combines the Malpas and Whitchurch offices and opens its headquarters on the Hampton Industrial Estate in Malpas. This location is perfect for servicing clients in the North West of England, Wales and the Midlands. The company has its very own onsite wholesale trade warehouse. The retail outlets remain open. 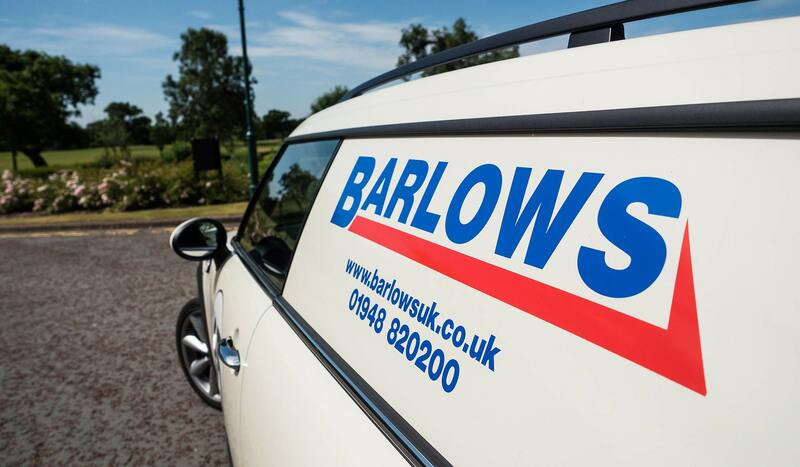 Barlows opens its first regional branch in Chadderton, Manchester in 2005 offering a full range of electrical services to Greater Manchester, Lancashire and Yorkshire. In 2008 work begins on a new build office on The Hampton Industrial Estate. Due to increased expansion all contracting divisions are moved to the new headquarters. The old Barlows building undergoes a facelift and later becomes the City and Guilds training academy and allows for the supplies department to further develop. Barlows training academy is opened in 2010 and goes on to be recognised in a series of regional and nationwide awards including being voted as the City and Guilds Top 100 Apprentice Employer in 2012, 2013 and 2014. The academy offers City and Guilds electrical apprenticeships and also runs a range of Health and Safety courses. In 2013 the company celebrated 65 years and our ‘retro’ anniversary minivan was commissioned to celebrate. Barlows becomes a multi-award winning company scooping The High Sheriffs Award for Enterprise, for Training, Development and Opportunity for Young People, The North West Chamber of Commerce People Development Award, The Greater Manchester Chamber of Commerce Medium Size Company of the Year Award and Cheshire Business Person of the Year Award! 2015 also sees the opening of the new Fire & Security office to house the existing department due to it’s rapid expansion. Barlows has grown to 300 staff and over 200 vehicles with contracts across the UK. We have two main offices in Cheshire and Manchester each with its own trade supplies department and a training academy. We continued our success by picking up more awards in 2016 by winning Employer of the Year at the Cheshire Business Awards. We also were awarded The High Sheriffs award for Enterprise for training, development and opportunity for young people. At the end of 2016 saw Barlows (UK) continue to expand by opening a new office in High Wycombe. The start of 2017 saw Barlow’s continue our growth by opening a new office in Lancaster. The new office follows from the success of the High Wycombe branch. These new branches enable us to get close and have quicker access to our customers in these areas, improving our service. We also had more success in the High Sheriff’s Awards, we were awarded the Roberts Bakery Family Award for Excellence. You can read all about our awards for 2016/17 here.